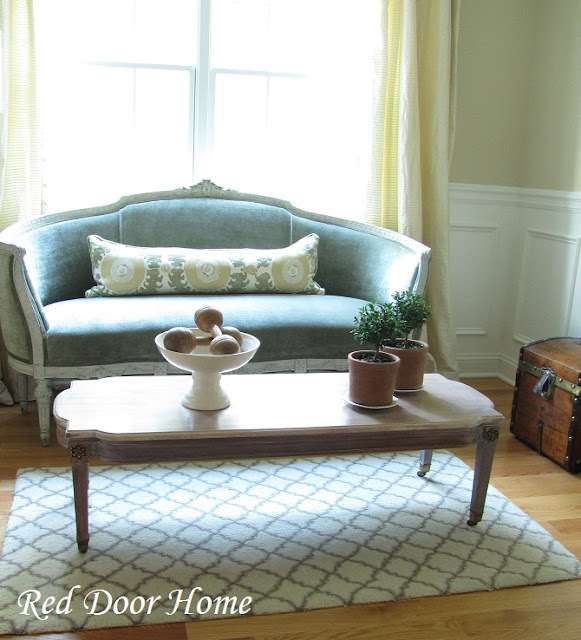 Red Door Home: Refinished Coffee Table – the details! 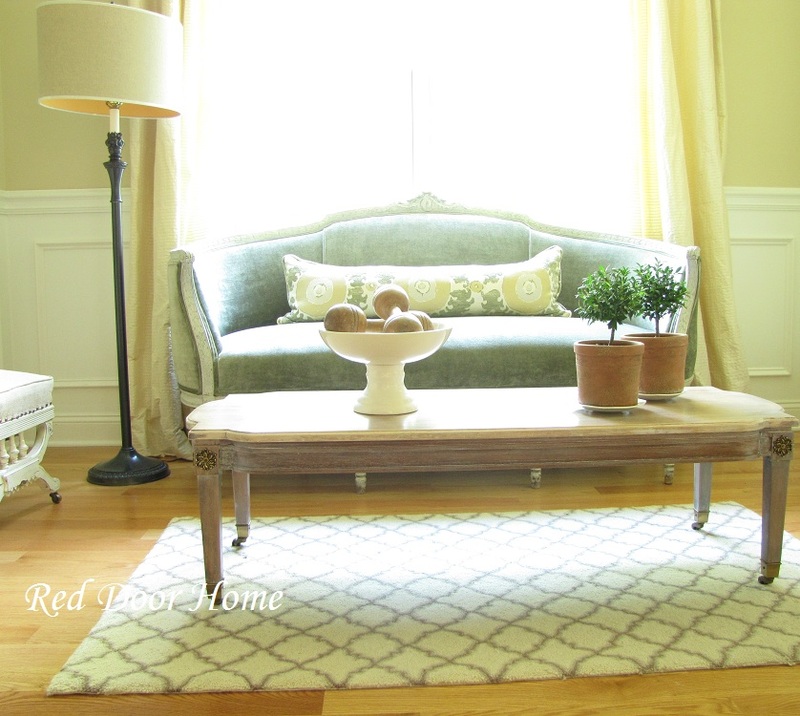 Refinished Coffee Table – the details! 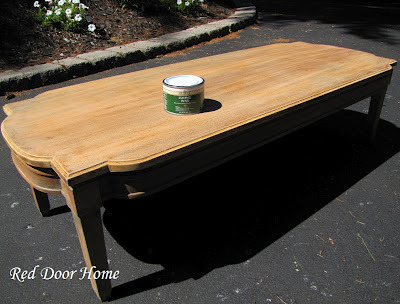 A little while back I shared a sneak peak of a coffee table project I was about to begin using a new-to-me refinishing technique. I am happy to report it is complete and turned out even better than I had hoped! Above is what the table looks like today and below is a picture of what the table looked like when I started. I loved the shape and scale of the table for our office sitting area but it was very orange and too shiny. 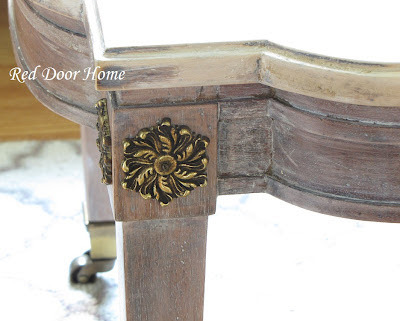 My original refinishing plan was to use a furniture stripper followed by sanding with a palm sander. My plans changed, however, when I visited my local Lowes store. The salesperson I worked with just happened to be a woodworker and suggested I try using acetone for removing the finish, followed by a good hand sanding. The acetone, he said, would remove all the inorganic elements (stain and varnish) from the wood and by using a 00 grade of steel wool the table would require only hand sanding to achieve a perfectly smooth finish. It sounded pretty simple so I decided to give it a try. After he explained the safety considerations when working with acetone – it will burn your skin and eyes and is highly flammable and should only be used in well ventilated (outside) areas away from any open flames – we went around the store gathering up the supplies. I needed acetone, chemical safe gloves, a full chemical face mask, 00 grade steel wool, fine grit sand paper and a small metal bucket. I began the project by removing the brass casters and decorations from the table. The table was then placed outside on rocks (acetone will kill grass) in the corner of our garden area on top of a layer of plastic and newspapers. I tied my hair back, wore long pants, a long sleeved shirt tucked into the chemical safe gloves and the face mask to make sure I was fully protected. Once I was ready to go, the project was fairly straight forward. 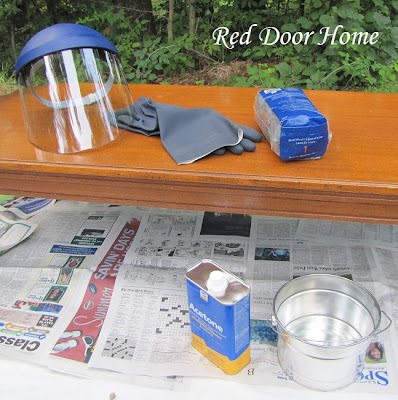 Simply pour about an inch or two of acetone in the metal bucket, dip the steel wool into the acetone and then start scrubbing with the grain of the wood. (Acetone will evaporate quickly so you only want to pour a small amount in the bucket at a time.) Keep dipping the steel wool into the acetone and scrubbing. When the steel wool “wears out” grab a new piece and repeat the procedure until you are satisfied with the results. After all the finish was removed, I sprayed the table with water using a garden hose and let it dry outside. When the table was completely dry it was time for a hand sanding to even out the grain of the wood and remove any residue. It took about 3 hours for me to remove everything from the wood using the acetone and steel wool plus more time for sanding. It was a lot of work but the results were worth the effort. 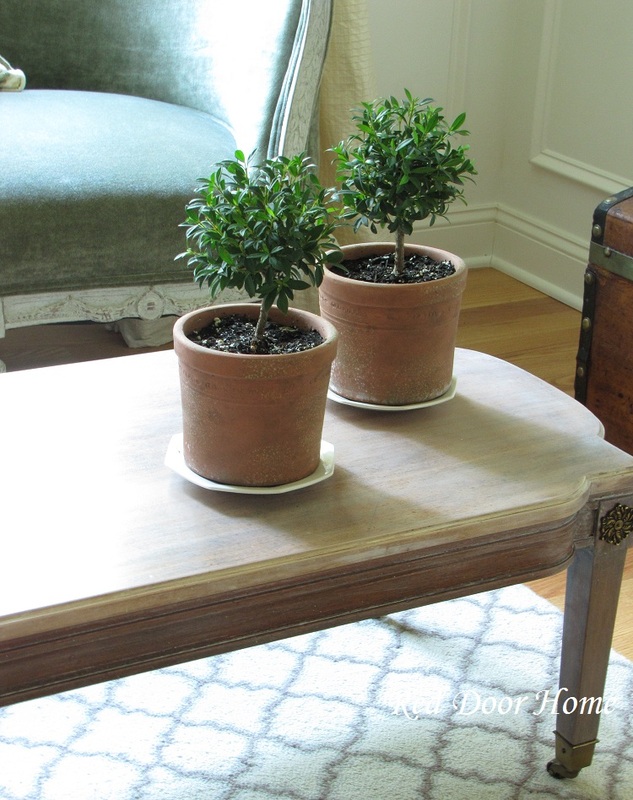 The table was returned to the natural wood color and was extremely smooth. 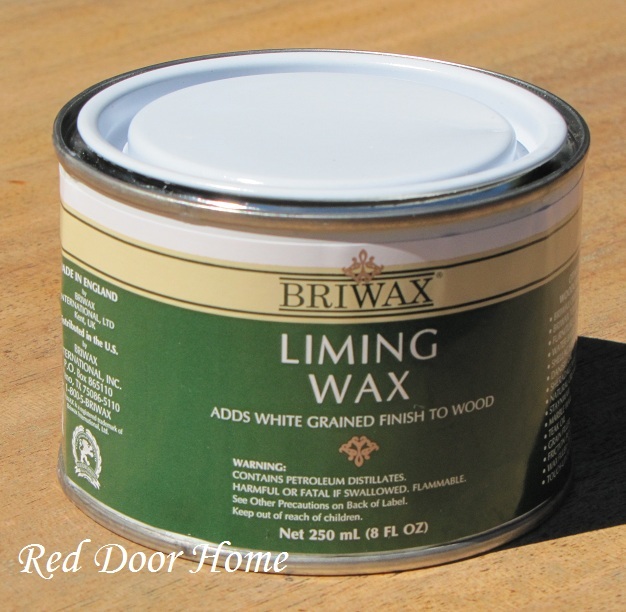 Since I wanted the table to have a light, slightly white finish, I decided to try another first for me - Briwax liming wax. I could not find it locally so I ended up ordering the wax online. I simply followed the directions on the can and applied small amounts using a cotton cloth. I kept applying the wax until I had the look I wanted. Once the wax was dry it was time for a top coat of furniture wax. I used a clear finish furniture paste wax by Minwax. The table turned out wonderful! I also have to say liming wax has now been added to my list of favorite products. I have already used it on another project which I will be sharing shortly and have found myself looking around my house to see what other wood pieces I can use it on! I am curious to know, have you ever tried using acetone and/or liming wax? Were you happy with the results? Looking forward to hearing about your experiences! Note: Please be sure to read all the instructions and warnings on the acetone container and wax as well as consulting with a salesperson to make sure you have all the proper equipment to order complete this project safely. Nice, I love that couch too! 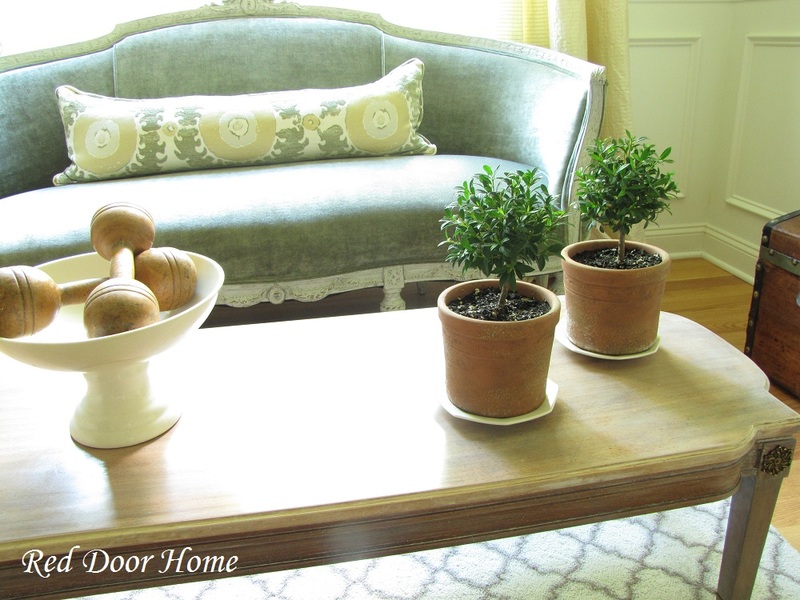 Hi, Stacy - Your coffee table looks fabulous! Wonderful classical lines and details. 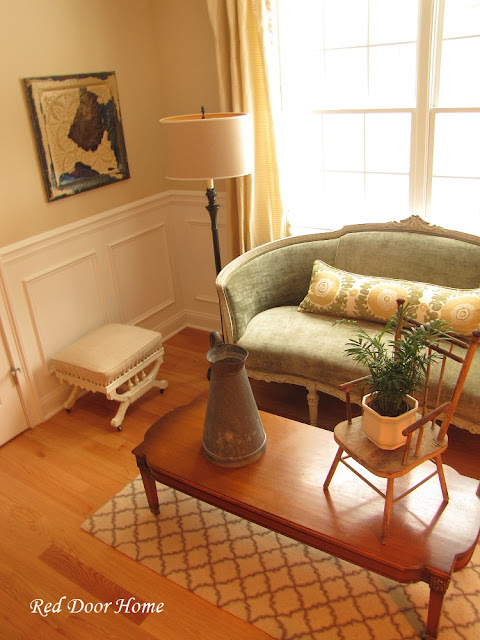 Love the shaped corners and castors! I've never heard of Briwax liming wax......thank you for sourcing this product! Hope you are doing well. Well done, Stacey! The table is beautiful and I am very impressed you did it yourself. Thanks for the peek at your lovely office as well! Love it Stacy! Never used either product before (well acid tone for nails back in the day lol) but I would love to try it. Just wondering, the top turned out lighter than the legs, did you do something different to achieve that effect or was it just the wood taking the product differently ? WOW Stacy, it looks gorgeous!! Love it's new look! I love the look you achieved with the liming wax! Well worth all the work you put into it. And I like that it is two toned even though it wasn't planned! I like the way the table turned out. Funny, I have never thought of acetone being used for things other than removing nail polish. I would like to try this technique but I'd like mine to have a more polished look, not the laminated shiny look. What product would you recommend for that? 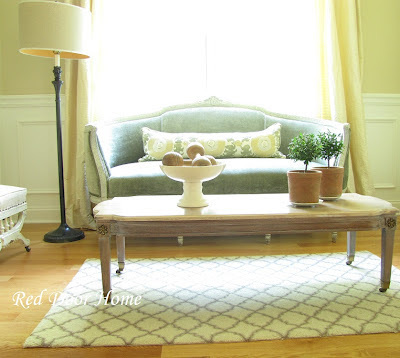 Family Room Photo Shoot Published!